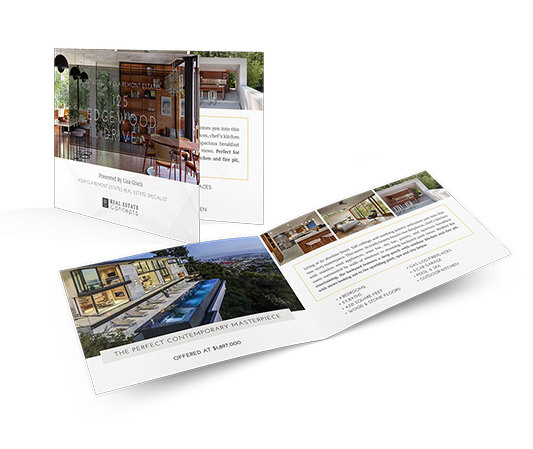 Generate leads using these uniquely sophisticated postcards that create a “call to action” – showcasing your experience and professionalism while providing quality information to homeowners. 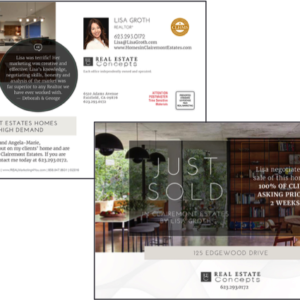 Leverage the success of a recent sale, create a powerful message or invitation about a new listing, thank the community, or send seasonal greetings – these are an economic and effective addition to your market program to outclass the competition. • 2-4 high resolution photos. 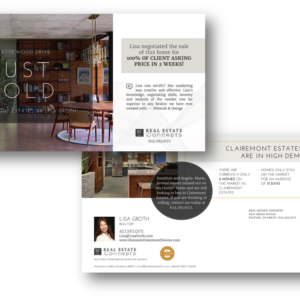 • Includes branding and your realtor information. • Personalized Call to Action to each homeowner. • 24 hour turn-around times on complete orders. • Bulk mailed within 24 hours of final approval. Design time: is charged at $39.00. (Unless full customization is required, then charged at $79.00 per hour).